Thirteen weeks ago, a handful of former Simple Math raiders and friends left behind our alt raiding guild project, Peach Kitten Licks, with one goal. Make Simple Math great again. Since reforming we have dominated the Andorhal server cluster, true to tradition, in our climb of Antorus the Burning Throne. 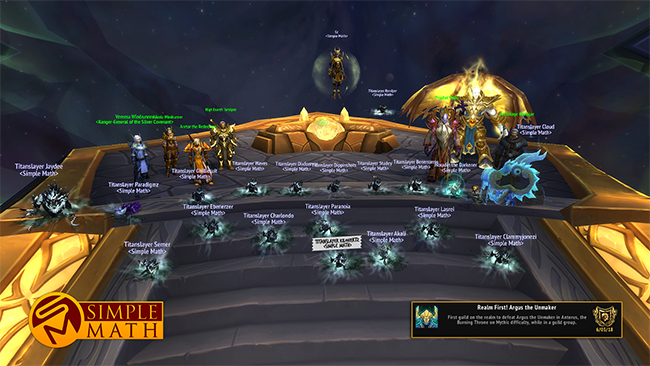 Now we sit here after unmaking the unmaker, with yet another end tier realm first kill to add to our collection, looking forward to our ultimate goal. Reclaiming Simple Math's place among the top US guilds in Battle for Azeroth. Do you think you have the drive to reach that goal with us? Apply now! good job guys, this is a big accomplishment.